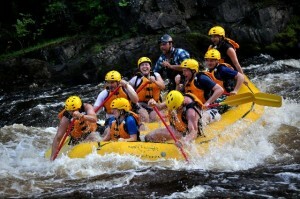 Rafting on the River…for work! BlogGeneral HRWCRafting on the River…for work! On Wednesday afternoon I joined a group of paddlers (all women!) to test drive a few rafts down the river with the idea of developing senior programming for the City of Ann Arbor and possibly in concert with the UM Turner Geriatric Center. Yep, I never thought of rafting the river but it is a great way to get small children and senior citizens out on the river safely while providing some education and guidance about the river. It was a gorgeous sunny day to take the trip from Argo livery to Gallup Park. Gallup Park canoe livery and launch is under construction but you can take out at the boat launch just a bit downstream. Unfortunately the river in this section was considerably impacted by some odd operations at Barton Dam so the water level dropped off. Where we were expecting about 400-500 cubic feet per second (CFS) of water in the river; we were greeted with only a mere 200 cfs. This made the ride through the Argo Cascades very bumpy and wet and then past the cascades, it meant a lot of walking and pulling the raft over rocky bottom. We were the only boats on the river and it provided us an opportunity to see many birds. We saw two osprey as they hunted their way down the river from Riverside Park in Ann Arbor to downstream of Island Park. And we saw numerous blue herons (its hard to tell if you are seeing the same 2 over and over again, or new ones). They enjoy perching on logs or taller branches overlooking the river. Despite the river being very low, the water clarity was great and being up on a raft allowed a better vantage point to see the tons of fish and river bottom. The section below Island Park back by Fuller fields seems like a great, remote fishing spot. 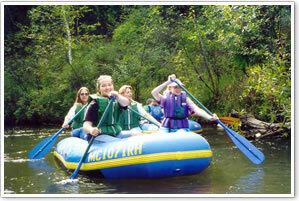 and finally, we need to tie in a pre-raft class at Turner as part of the programming. If you have ideas about river trip programming for seniors please let me know as we will be developing our ideas over the winter. I’m sorry I have no pictures of the trip, but my phone was in the drybag the whole time! Highly advised when you go through the Cascades in low water.